If you have information that you think may be of interest to the SEC, it’s important to understand the basics surrounding the whistleblower program, what the eligibility requirements are, and what potential limitations are in place. Whistleblower actions with the SEC are covered under Section 922 of the Dodd-Frank Wall Street Reform and Consumer Protection Act. It’s important to retain a Florida whistleblower attorney as these are such complex matters. Who is eligible to be a whistleblower? An eligible whistleblower is someone who submits original information about a possible securities law violation that has happened, is ongoing, or is about to happen. The information that is provided must result in a successful SEC action that results in more than $1 million in monetary sanctions. You are not required to be an employee of the company you are reporting about. To be eligible for the award, the information must be submitted in a specific form and manner. What is the type of information that the SEC is interested in? Original information is something that you know independently, rather than information found in publicly available sources. It can also include independent analysis, even if that is an evaluation of information that might be available in public record, so long as the analysis reveals information that is not generally known, and the information is not already known by the SEC. What if I want to submit information anonymously? You can submit information anonymously, but you won’t necessarily be eligible for a whistleblower award. In order to qualify for a whistleblower award, you must have an attorney represent you who submits the information through the required Tips, Complaints and Referrals questionnaire or a hard copy of the TCR, both of which require an attorney certification. 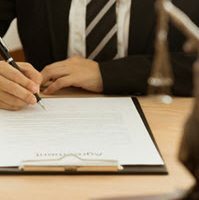 In addition, you are required to give your attorney a completed hard-copy TCR which was signed under penalty of perjury in conjunction with your anonymous submission. How do I apply for an award? Once you see the case information posted that you think your information led to, you have to complete a specific form, WP-APP, and return it within 90 calendar days to the SEC’s Office of the Whistleblower. If you think you have original information related to securities fraud, it’s important to speak with a skilled Florida whistleblower attorney right away. The attorneys at McCabe Rabin, PA are well-versed in a variety of whistleblower lawsuits, including SEC matters. Contact our West Palm Beach office to schedule a consultation today.